If you buy only one kitchen gadget for your home this year, it should be this incredible Crock-Pot Express Crock multi-use slow cooker. 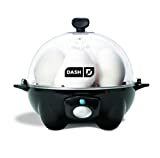 But if you get two kitchen gadgets, the second one should definitely be the Dash Rapid Egg Cooker. This fantastic device cooks perfect eggs every time, and it works with a bunch of different styles including omelettes. It’s on sale right now on Amazon for less than $20, and it’s easily worth twice as much. Definitely check it out.